I have removed caffeine from my diet in an effort to get my General Anxiety Disorder (GAD) under control without the use of medications. 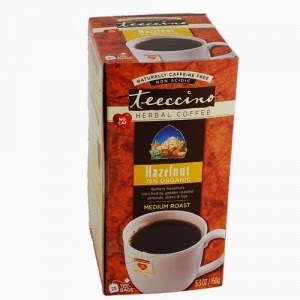 However, I really enjoy iced coffee drinks so I picked up some Teeccino which markets itself as a 'herbal coffee alternative'. My local store only has the Hazelnut and Vanilla Nut Flavors. I found the ingredient list intriguing which is why I first picked this product up. The ingredients on the Hazelnut product are 'organic roasted carob, organic barley, organic chicory, dates, almonds, hazelnut flavour, organic figs'. There seems to be a lot of intriguing flavours available on the website. The product presents surprisingly like 'real' coffee. I use a French press and have only had this product over ice as I drank 99% of my coffee that way. This product has eased my transition into a coffee-free lifestyle and has been a tasty substitute for 'real' coffee. I will be purchasing more flavours in the future!